1. Does this candidate set personal and professional goals? 2. Does this candidate have confidence in their abilities, and do they demonstrate continued self-improvement? 3. Would it make sense to hire this candidate, considering the company’s needs? Is the position a match for this candidate’s aspirations? If we know the general gist of what the interviewer is trying to learn about us, we can form our answer to address those questions. Side note: It’s okay if you don’t aspire to be the CEO. The key is to stay true to yourself and go for the roles where your strengths will shine. 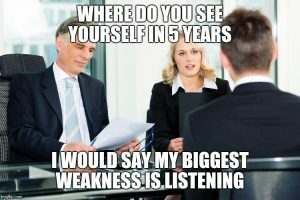 On the flip side, a quick word of caution to those who may be more inexperienced, but do have an eye on quickly climbing the ladder……while goals of becoming the next division leader show professional drive, the interviewer will want to ensure you have the patience and grit to achieve mastery in the lower level role you’re currently trying to land. Let’s go ahead and look at an example answer to “Where do you see yourself in five years?” below. This candidate has just graduated college and is interviewing for an entry level Customer Service role. This candidate showed they had a plan for settling down in the area from a personal standpoint. They didn’t just randomly pick this job to apply to….they are specifically interested in the role, and have experience with what it entails (therefore they sound confident they will thrive). They don’t necessarily say they want to be a Customer Service Manager in five years, but the answer leaves us with the idea that this person will be putting in the best effort to be considered for promotional opportunities for which they are a fit. There’s plenty of room for further questions/exploration about what that path looks like at that particular company. Since we don’t typically come to an interview with a sound understanding of the company’s needs, we may need to ask some follow up questions to fully address number three in the list above. As long as you’re in tune with your aspirations, and come prepared with an answer that addresses the three questions in the list above, you’ll successfully navigate this interview question. You may even determine the role is not for you. After all, the purpose of a job interview is to determine if the job is a fit for both the employer and the candidate! Find other common interview questions here.